Repairing minor paint flaws through polishing is not harmful to the paint system unless you remove too much paint. If more than 50% of the clearcoat finish is removed, you stand a good chance of premature paint system failure. If more than 75% of the clearcoat finish is removed, you will experience immediate paint system failure. It can be a very fine dance between success and failure. Here's a general rule to follow. If a scratch or other flaw can be felt with your fingernail, it's too deep to be completely removed through polishing. That's not to say that polishing won't help hide the flaw; it will. Take a look at the following 3M diagram showing paint layers and minor scratches (marring) in the clearcoat surface. These scratches can be removed completely through polishing, because more than 50% of the clearcoat would remain. Non-clearcoat finishes have the same basic rules. You should not remove more than 50% of the top coat (color coat) finish when repairing a scratch or other paint flaws. It is important to understand how a polish can be used to "hide" scratches and other micro marring. In the two diagrams above, you can see that the scratches have hard edges that run at a 30 to 60 degree downward slope. It is the hard edge and angle of a scratch that creates a perfect opportunity for light reflection. It is this reflection that enhances the visibility of the scratch. A good polish rounds the edges of scratches, reducing reflection. Scratches - Surface abrasions that do not extend past the first 25% of top coat material can be fully repaired by polishing. Deeper scratches can be improved as long as they do not fully penetrate the color coat into the primer. Scuffs and rub marks - Scuffs are broad, shallow surface abrasions that are easily repaired by polishing. Rub marks are commonly caused by shoe heels (getting in and out of the car) or the bumpers of other cars. The rub mark is generally a transfer of rubber or other vinyl material to the paint surface. Rub marks are easily removed by compounding and polishing. Micro marring - Micro marring, also known as swirl marks and spider webbing, means very small scratches in the paint's surface. Micro marring is created by machine compounding and in everyday use and maintenance of the vehicle. Micro marring is easily removed by compounding and polishing. Etching - Paint etching is a common problem caused by hard water (tap water) or acidic water (acid rain). Bird droppings are another common cause of paint etching. 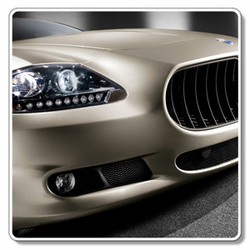 Depending on the severity of the etching, polishing will repair or lessen the appearance of etched spots. Dust nibs - Small particles of dust and other foreign material that land on the paint during the painting process create small nibs on the surface. Wet sanding, compounding and polishing will remove the visible portion of the nib and level the paint. Orange peel - When a car is painted, the paint is applied at a consistency and thickness that allows the paint to flow (briefly) and level. If the paint is applied too heavily, sags and runs will result. If applied too thinly, the paint does not properly flow and level, causing an uneven surface called orange peel. If the orange peel is not severe, abrasives can be used to level and glaze the finish to match the rest of the vehicle. Runs and sags - If paint is applied too heavily, sags and runs will result. If the sag or run is in the clear coat, it can be repaired, but not if it is in the color coat or primer. On a non-clearcoat paint, sags and runs in the color coat can be repaired. Remove Scratches, Acid Rain, Severe Swirl and Other Defects! Produces Deep, High Gloss Finish!